Husky Liners Floor Mats - WeatherBeater - Dezod Motorsports Inc - Home of the automotive performance enthusiast since 2002.
usky Liners® brand WeatherBeater™ Floor Liners offer a fresh appealing design complimenting today’s current model cars, trucks and SUV’s interior styling, with the same functionality and protection that’s been proven with our original Classic Style™ Floor Liners. This new design is also custom-fit, features containment walls to help keep messes away from your shoes and patented “Nibs” to help keep your liners from shifting. 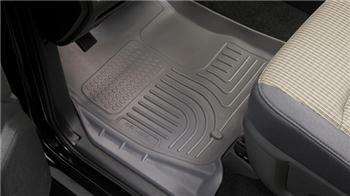 In addition, the WeatherBeater™ liners use key elements of your vehicle’s interior to give your floor liner a customized look and feel. An additional Form- fit Edge™ at the door threshold allows for easier entry and exit. Again, Husky Liners® lifetime warranty against cracking and breaking makes this a great value.